Solve your Christmas present dilemmas and give something unique and memorable this year. Buy one of our 2 for 1 windsurfing lessons or any of our other lessons/rental as a gift voucher and we can send it to you within minutes – Christmas shopping done! The beginners windsurf lesson 2 for 1 offer is running again this year for December only, so grab yourself a bargain & take the effort out of your Christmas present shopping! Or maybe you just want to treat yourself to something you can look forward to next year? Like most sports windsurfing is best learned from someone who really knows how to break down the learning stages & provide you with the key learning blocks. Your progression is just so much quicker when you have windsurfing lessons to get you through the basics, onto improver & then advanced windsurfing skills. Learn to windsurf with a friend & split the saving between you or give 2 Christmas presents for the price of 1, either way this is a great deal that you should take before the offer finishes! Whether giving a windsurf gift voucher to someone you know or just as a treat for yourself, it will be something to really look forward to when the weather warms up this coming spring. 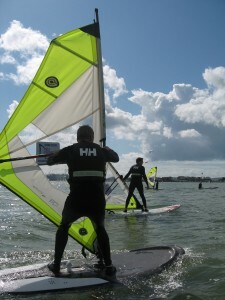 Happy Christmas from Poole Windsurfing & hope to see you all on the water next season!